LinkedIn is the largest and vibrant social professional network which is a hub for professional and young talents to gain opportunities. Young professionals graduate out with an ambition and dream to start their career, but still baffled about where to start from. LinkedIn has been the source and integral part for many professionals for job hunt and securing their initial professional role. It is the duty of the professionals to make the best use of LinkedIn and make their profile stand out from the rest. 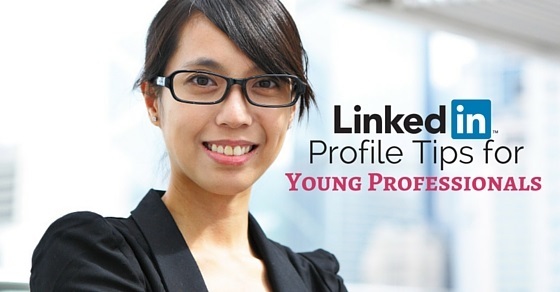 There are ample professional tips for young professionals who use LinkedIn and hence those pointers are mentioned below. Professionals should make out what they are string at and they must have a passion. In spite of your experience in your career, find out the passion you have and the area you are expert at. For ones who desire an inspiration for their post, think about the aspect which brings you out of your bed. The fanaticism for the aspect which is radiated on the screen would be felt by the reader. Professionals should thus make sure to mention their passion in their LinkedIn profile. To grab the attention of employers amongst millions of posts is quite tough, when you have a dull headline. Your headline should be a striking one which captures the brilliance of the post. Professionals should make sure that they need to be very clever in order to write a headline. Professionals should write a post in such a way showing what the value position is. Also remember that in the web world, a short and ratty post always wins. It is evident that there is no maximum word count for publishing any post, but professionals should bear in mind that less is always perfect. Professionals should remember to be wary about the long academic sentences which they used in their history lessons, the web is not the appropriate source to post long blocks of text. Professional should make their profile crisp and perfect with their phrases. Professionals are aware that there are millions of profiles uploaded in LinkedIn and hence they should post their thoughts regarding their next move in a captivating manner. You should mention your post in a manner you distinguish yourself from others as an ideal candidate. You are to enter your dream job and hence your profile, posts and all aspects should be completely outstanding when compared to others. The best tool ever in LinkedIn which evidences your argument and leads the user to a pool of supplements and rich content is the hyperlink tool. They avert collegiate prose and making unwieldy writing. Hyperlinks are the best partners used by many publications on the web. It would be great to stick to one per paragraph. Professionals should remember to know more about hyperlinks and use the same in their LinkedIn profiles. As professionals your posts are always linked to professional brand and hence making use of active language is mandatory which shows your confidence. The usage of passive voice in the profile would only strangle your writing and hence dilute arguments and calls for action. Professionals should make sure to use active language in their posts to show their credibility. Professionals can make use of LinkedIn for developing their network which can be beneficial for employment purpose. There are a number of groups where many professionals do not know the value of groups and contacts. The Alumni network of your college is one best start where you can get activated. LinkedIn is a site dedicated for professionals and there are a number of professional groups in which professionals can participate. The groups are in various forms such as industry related, location specific and lot more. There are also groups which are formed on the basis of interest, career, profession, check your appropriate one and join that group. There are also groups for new graduates where you can get to know more information related to current openings, jobs and recruitment. For professionals to get hold of a job easily, LinkedIn has a number of tools which has a number of features. In that manner the LinkedIn student job section is a tool where a number of companies can be found who are hunting for fresh graduates. Beepmo is a mobile app which is GPS enabled. With this tool based on your location you can get connections which make finding people easy. For professionals who have worked on a number of projects in jobs and colleges can make use of the tool called creative portfolio display and present your connections about you. To get to know about latest and relevant books the reading list tool is beneficial. In the same manner the link out tool is another best tool which can help you find time together with your connection. This tool is useful as it can check with your calendar and connection calendar for a perfect time together. Gathering business card and linking with everyone on Facebook is not possible always. The tool hello automatically uploads information from business cards once photo is taken. Events are another tool beneficial for professionals to stay on top of events for networking purpose and elevating your career with LinkedIn. LinkedIn profile is viewed by a number of employers for your skill set and experience and hence branding your profile is really important. Your profile is the one which makes you appear many times in the search result. Your LinkedIn profile information is made available to google search engine for index. In order to execute this option develop a public profile and select ‘full view’. Rather than using the default URL, professionals can customize the URL to the actual name. This link can be included in the profile of your signature for enhanced visibility. Put your best foot forward in developing your profile, so that, ones who view your profile, seek you instantly. Branding your profile can be done with the best keywords, vision and experience. LinkedIn Answers is a feature in LinkedIn which helps you broadcast your business related questions to your network. By this way professionals gain more responses from the network compared to open forum. Professionals can thus make use of these features in LinkedIn. Professionals profile is made highlighted and most wanted with the experience and skills in their LinkedIn profile. Professionals should make sure to include part-time jobs, internships, and more in their profile. It is best advised to include everything what you learned in your LinkedIn profile. Adding skills and experience is mandatory which can helps professionals in many ways. Make your professional profile an outstanding one by mentioning all the tasks you have undergone. If you have been a volunteer, do mention in your profile as 40% of hiring managers look through volunteering as an experience. Also remember to flaunt your points of pride, feel good about your pride and add these points in your profile. Include your honors, awards, volunteering activity in your profile. Make your LinkedIn summary memorable and meaningful. By reading through your summary people should make out who you are and what you do. The opening line may have your mission, your passion and about you. In the same manner a strong closing sentence is mandatory. These are few points that can be beneficial for professionals to formulate their LinkedIn profiles. LinkedIn profiles are mandatory for any professional and hence proper care and getting to know all the technique and tools available is important. There are ample links which assist professionals in developing best LinkedIn profile and making use of them. There are also numerous features in LinkedIn which help professionals to invite in a number of contacts and get recruited. LinkedIn professionals also provide the chance to gain elevated opportunities in terms of career. With such beneficial aspects, developing a profile with LinkedIn has become very important and professionals. Professionals should make sure they upload the best professional photo, perfect summary, keywords where ever required and lot more aspects required for a profile. Professionals who are unaware of the various features and aspects in it and making use of them, can run through the above mentioned points and get benefitted.